Egyptian cinema lost Mary Mounib on 21 January 1969. Mounib wasn't an ordinary comedienne. She was the first woman to break men's monopoly on stardom in the comedy field. Definitely before her there were actresses who had the capability to play comedy roles. But none of them achieved the success Mary Mounib attained. Plays were written for her and she was cast as the leading lady the same as male comedians. She was born Mary Selim Habib Nasr on 11 February 1905 in Al-Ghouta, near the Syrian capital Damascus, to a Lebanese family from Furn Al-Shubbak area. She came to Egypt as a child with her mother and elder sister, following her father who came to speculate in the Egyptian Cotton Exchange. As if it were a cinematic coincidence, just as the family arrived to Cairo, the father returned to the Levant. Her mother was preparing to go back as well when she learned that he had died. They then remained in Cairo to face an uncertain future. For some time, Mary was enroled in the Deliverande School in Al-Faggala neighbourhood, where many foreigners and minorities resided. She stopped attending school when she was still under 12 years old. With her elder sister, Alice, she started working as an extra for the Ali Al-Kassar Theatrical Company around 1917. Then they joined the Amin Attallah Company. Afterwards she formed with Fawzi Mounib, her husband at the time, a theatrical company bearing his name and through which she got to know a number of brilliant stage luminaries, on the top of which came director and actor Bishara Wakim. 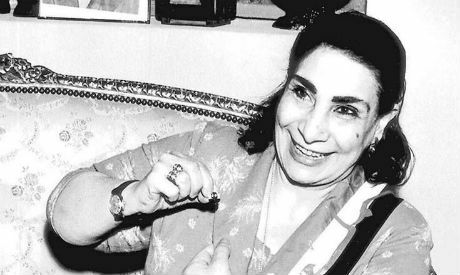 In 1934, Mary Mounib went through the most important leap in her artistic career, joining the prominent Naguib Al-Rihani Company, named after Egypt's top comedian. She remained with it until her death. In this company, her artistic character began to be shaped at the hands of the company's founder, and his partner, playwright Badie Khairy. She was known for playing the low class sharp-tongued woman, or the mother-in-law who liked to upset the happy lives of husbands and wives. Both characters were the base upon which Mary Mounib achieved her broad popularity. But when precisely did Mary Mounib begin her cinematic career? And who was behind this step? In 1934, she was cast in a small role in Son of the People (Eli Aptikman) through her old friend Bishara Wakim who co-produced the film. Then she played other minor roles in Al-Ghandoura (1935) with the songstress Mounira El-Mahdiya, His Highness Wants to Marry (1936, Alexander Varkasz) with Naguib Al-Rihani and The Chant of Hope (1937, Ahmed Badrkhan) with Umm Kulthum. Despite achieving but moderate success Mounib in her early cinematic period, in contrast with her stage beginnings in Naguib Al-Rihani Company, this success was enough to push her into leading lady roles. The first such role was under cinematographer and director Tulio Cabarini who chose her to star in My Wife No 2 (1937). However, her breaththrough role was in Determination (1939, Kamal Selim) where she played the mother who wants her daughter (Fatma Roushdy) to marry one of the alley’s rich men against the daughter’s will. In that film, Mary Mounib didn’t only move to playing the role of an adult woman's mother — although she was only 34 at the time — but also moved to playing a sinister character whose only care is hoarding money, even at the expense of destroying her daughter’s marriage. She didn’t play such a provocative mother-in-law again except in Foreman Hassan (1952, Salah Abu-Seif). It is true that in that role she wasn’t as sinister as in Determination, whose sharp-tongue and tone of rebuke was too high at the expense of comedy. Her interventions were rather borne of keenness to secure the well-being of her son or daughter. Thus, irksome situations ensue and usually generate comedy. In her role in The Lady's Game (1946, Wali Eldin Sameh), which she reprised in The Honorable Family (1964, Fateen Abdel-Wahab), she sought that her daughter get divorced in order to marry a richer man. Hers wasn’t the character of a deviant so much as a supporting mother nonetheless taking her care for her daughter to extremes. Of course, Mary Mounib’s refined comedic performance alleviated the distaste some viewers would have felt towards such a character. This is an important difference between “Sanyya Gunnah,” Naguib Al-Rihani’s mother-in-law in The Lady’s Game, and “Umm Fatma,” Hussein Sedki’s mother-in-law in Determination. Mary Mounib played variations of the mother-in-law role, the most prominent were My Mother-in-Law is an Atomic Bomb (1951, Helmy Rafla) and A Marriage Tale (1964, Hassan El-Seifi). The majority of her roles were that of a traditional mother-in-law, who doesn’t aim at separating the married couple but seeks to have a presence and a role in the life of her son or daughter even if her intervention — without willing or wanting to — means driving the marital couple to the edge of distraction. This was demonstrated in The Charming Mothers-in-Law (1953, Helmy Rafla), Ismail Yassin’s Ghost (1954, Hassan El-Seifi), This is the Love (1958, Salah Abu-Seif) and A Husband’s Confessions (1964, Fateen Abdel-Wahab). It is noteworthy that Mary Mounib in her films was capable of transforming small parts into major ones that paralleled that of leading roles to the extent that the viewer may not remember anyone except her. Perhaps her most prominent role in this context was her final role in Thieves but Funny (1969, Ibrahim Lotfi). Mary Mounib, known as the sharp-tongued low class woman or the hot-tempered mother-in-law role, was transformed into an extremely meek and good-natured woman, perhaps with a bit of naivety and helplessness, when she played the role of the mother in Papa Amin (1950, Youssef Chahine) and in A Letter from an Unknown Lady (1962, Salah Abu-Seif). Rebelling against mother-in-law roles, we can see her acting the spinster in Omar Bey (1941, Niazi Mostafa) and in Abu-Halmous (1947, Ibrahim Helmy) with Naguib Al-Rihani or when she played a Turkish lady in Martyrs of Love (1944, Kamal Selim) and April’s Fool Day (1954, Mohammed Abdel-Gawad). All these were variations on the character she played in her best remembered play, To Five, produced by Naguib Al-Rihani Company. Whatever role she played, Mounib had full control over her attributes as an actress, whether her outward appearance, movements, or her superb capacity to change the tonality of her voice. It is worth mentioning that starring roles were offered to Mary Mounib in nine films, which is considered a large number for a comedienne. These included My Mother-in-law is an Angel (1959), A Bitter Honeymoon (1960, both by Essa Karama) and People Downstairs (1960, Kamel Al-Telmesani). In her final years, many roles were written especially for her. Such was her renown, and the respect she commanded.